Initiative, Initiative, Initiative in Chess! The three most important things in playing winning chess are initiative, initiative, and initiative! That has been my philosophy for many years. Although there are some exceptions and some other ways to play, I still believe that many chess games boil down to who can seize and keep the initiative. Three weeks ago, in the last round of the PRO Chess League, I saw a game that beautifully illustrates this point. In this game, world champion Magnus Carlsen plays three completely out-of-the-blue pawn or perhaps I should say "out-of-this-world") pawn sacrifices, none of which can be said to be clearly correct. But in every case the effect of the sacrifice was to keep his opponent (grandmaster Jaan Ehlvest) off balance and to ensure that Carlsen's attack would continue. The game was played at an rapid chess time control (15 minutes per game plus a 2-second-per-move time increment). In quick chess, fighting for the initiative becomes even more important. The game is not perfect, but in some ways I think that this makes the game even more valuable to the student. The moves give you a sense of Carlsen's imagination and intuition, his gut feeling about how the position should be played. It's possible that in a longer game he would have reined in his imagination and played more carefully, but then it would have been less instructive for us. I won't have much to say about the opening, but Carlsen seemed much more ... um, "creative" with his opening choices in the PRO Chess League than in serious tournaments. He even began games with 1. Nh3. Nevertheless, he still won at a very high rate, proving that openings are perhaps somewhat overrated. The other popular option here is 2. ... Nf6, which I like a bit better because it fights for the initiative right away. Black plays a sort of Alekhine's Defense, arguing (correctly, I think) that ... c5 is a more useful move for him than b3 is for White. Okay, I'll shut up about the opening now. This position was also reached in a game Carlsen-Leitao 2014 (also an action chess game), where Black played 10. ... Qc7. So Carlsen isn't just completely making this up -- he's seen the position before. A sly little move. Black is planning to chase White's knight with ... b5-b4, but first he wants to prevent the reply Nd5 by guarding his loose bishop. This is in the Nimzovich style of prophylaxis first, attack second. Position after 15. ... b5. White to move. Black starts his counterattack and threatens to play 16. ... b4 next move. It doesn't seem as if White can prevent this. For example, if 16. h5, then with 16. ... b4 Black strikes his target first. After 17. Nxc6? bc! 18. Nxe7+ Rxe7 19. Ba3 Qa5 Black is winning. Other players, more timid souls, might be tempted to play 16. Nxc6, in order to eliminate the dangerous light-squared bishop while we have the chance. However, after 16. Nxc6 Qxc6 17. a3 d5!, the initiative has clearly switched over to Black. Anyway, Carlsen does not want to exchange his knight off so soon -- he has better plans for that knight. In particular, it eyes the e6 pawn, a vulnerable target in Black's position. Would you believe it if I told you that Black not only doesn't get to play ... b4 on the next move, he actually never gets a chance to play it ever, in the whole game? With what magic wand does Carlsen distract his opponent from his intended move? I think that 90 percent of chess players would first prepare g6 with h5, but as we've seen that just hands the initiative to Black. Carlsen's move shows that you don't have to prepare -- it's better to seize the initiative right away. Note that, in order for this idea to work, White needs to have some way to prevent Black from keeping lines closed with 16. ... hg 17. h5 g5. In this position, Carlsen would refute that defense with 18. h6! g6 (still trying to keep the position closed) 19. h7+! The Black king is now forced onto the long diagonal with 19. ... Kg7 or 19. ... Kh8, after which 20. Nd5! threatens a lethal discovered check and Black can resign. Also note that Black cannot ignore Carlsen's bold thrust, because 16. ... b4 17. gf+ Kxf7 18. Qh5+ Kf6 19. Nxc6 also threatens a winning discovered check on the main diagonal. Thus Ehlvest is forced to react to Carlsen's move and yield the initiative to his opponent. Of course if 16. ... fg 17. Nxe6. That is why it was important for Carlsen to keep the knight on d4. Once again, Carlsen keeps his opponent off balance. Ehlvest does not have time to fight for the initiative with 17. ... b4 because of 18. hg! bc 19. Rh8+!! forcing checkmate. To play in this style, fighting for the initiative above all, you have to be imaginative and you have to see these kinds of tactics. A good solid defensive move, which the computer fully approves of. Ehlvest is not rattled yet; he defends his weak point on e6 and activates his dark-squared bishop. Position after 18. ... fg. White to move. Now how can White keep the initiative going? Another incredible move. I would have played first 19. Nxc6 Qxc6 and then 20. e5. And in fact, the move that Carlsen played could transpose to that line if Ehlvest plays 19. ... de 20. Nxc6 Qxc6 21. Rxd7!? Qxd7 22. Ne4 Qc7 23. 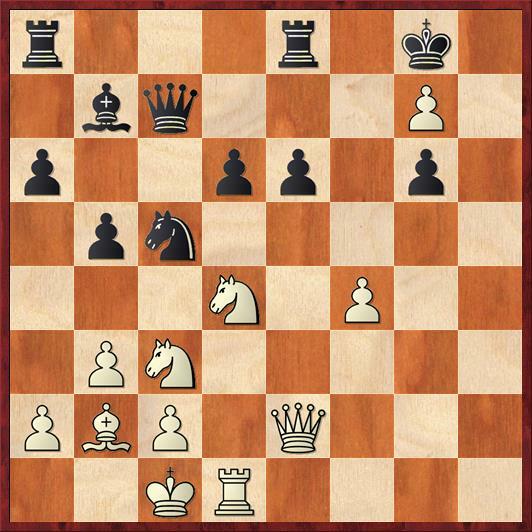 Qh2, with ongoing pressure for White. But I believe that Carlsen deliberately chose this move order because he wanted to give Ehlvest more things to think about and more ways to go wrong. He dangles the h1 rook in front of Ehlvest as bait. The irony is that, according to the computer, Carlsen's sacrifice is unsound. But that is because the computer can see variations like this: 19. ... Bxh1 20. ef b4! 21. Ndb5 ab 22. Nxb5 Qc6 23. Rxd6 Qb7 24. Rxe6 Nxf6! Here White has not one but two moves that look decisive but actually fall short. 25. Bxf6 would run into 25. ... Qf7! and White has to give the piece back, because 26. Rxe8+ Rxe8 27. Qf1 Qxf6 28. Qxh1 Qa1+ is disastrous. And after 25. Nd6 Qd7 26. Nxe8 Rxe8 27. Rxe8+ Qxe8 White's attack is flagging due to lack of material. Also the threat of checks or mates on the back rank continues to limit White's options. This kind of analysis is superhuman in a 15-minute game. Maybe in a full length game Carlsen might have worked out some of these tactics and played the less provocative move 19. Nxc6, I don't know. But I like the way that he played this game. He just lets it rip, and if Ehlvest can outplay him, so be it. Not too many humans can outplay Carlsen. 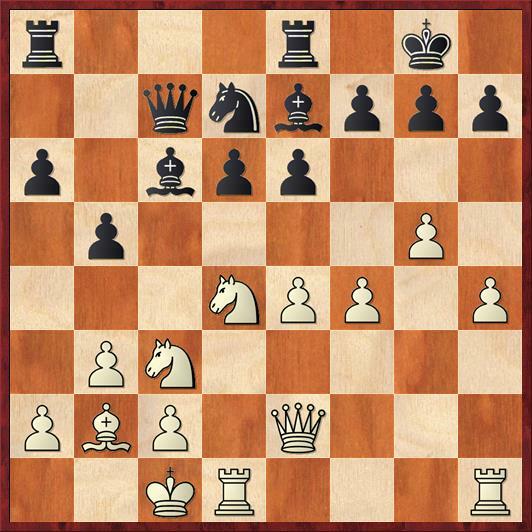 In my opinion, if you can play a move like 19. e5 in this position, you're a stud. Ehlvest takes the bait, and I'm giving him an exclamation point for courage, and because the computer says it's the right move. But here Ehlvest's unimaginative, human-like thinking betrays him. As the computer showed, the only way for Black to win is to play 20. ... b4. Initiative, initiative, initiative! The alternative was 21. Nxe6, but Carlsen probably didn't like the idea of walking into a pin. The text move creates a "bone-in-the-throat" pawn deep in Black's position, which will constantly give White threats of checkmating Black or promoting the pawn to a queen. Notice, also, how the exchange sacrifice has transformed White's bishop on b2 into one of the most important pieces on the board, and how Black's previously powerful bishops are either gone (the dark-squared bishop) or not doing very much (the light-squared bishop). Maybe 21. ... e5 was worth a try? But Ehlvest consistently chooses the solid move rather than the move that fights for the initiative. Position after 21. ... Nc5. White to move. Maybe Ehlvest was hoping for a pause in White's attack, but he doesn't get it. Strictly speaking this isn't a sacrifice, because White gets three pawns for the piece, but it's definitely an "all-in" move. There are many exchange-down endgames that can be drawn, but not so many rook-down ones, even if you have three or four or five pawns for the rook. Carlsen is playing for a checkmate or a pawn promotion. Setting up a mating net is such an important weapon for the attacker. If nothing else, it puts psychological pressure on the opponent, because the consequences of a mistake are so drastic. This is the only defensive move that Carlsen plays in the whole game. 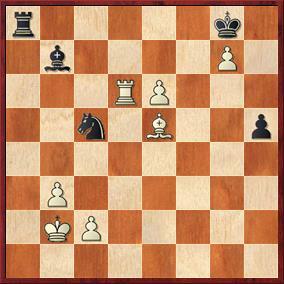 However, the threat of Qh2 and Qh8 mate is looming, so Ehlvest doesn't get a respite for long. The computer suggests 25. ... Bd5, but this move is very understandable. Ehlvest doesn't want to stumble into a checkmate. With ideas of playing ... Nxb3+, but Carlsen correctly sees that his own threats are stronger. If 27. ... Nxb3+ 28. Kb1 Black has to retreat the rook to defend against the threat of Qh8 check and g8Q checkmate. Position after 27. ... Ra8. White to move. Of Carlsen's three unexpected pawn breaks in this game (16. g6, 19. e5, and 28. f5), this is the one that was the most unexpected to me. I couldn't even figure out what Carlsen was trying to do. At first I thought that Carlsen had lost faith in his attack and was just trying to bail out to a draw after 28. ... gf 29. Qh8+ Kf7 30. Qh5+ Kg8, with a repetition available after 31. Qh8+. It was only after I looked at the game with a computer that I realized the tremendous importance of Qh5+, not as a way of bailing out to a draw but as a way of winning. This can be seen most clearly in what the computer says is the best line: 28. Qh8+ Kf7 29. Qh7! Rg8. This is the only way for Black to prevent the promotion-discovered check-mate, but -- spoiler alert! -- it takes away the only flight square for Black's king in case of Qh5+. So White wins with the unbelievable 30. Kb2!! Not 30. f5? right away because it allows 30. ... Qg5+. But after 30. Kb2! !, White's king is safe from checks and the threat of 31. f5 gf 32. 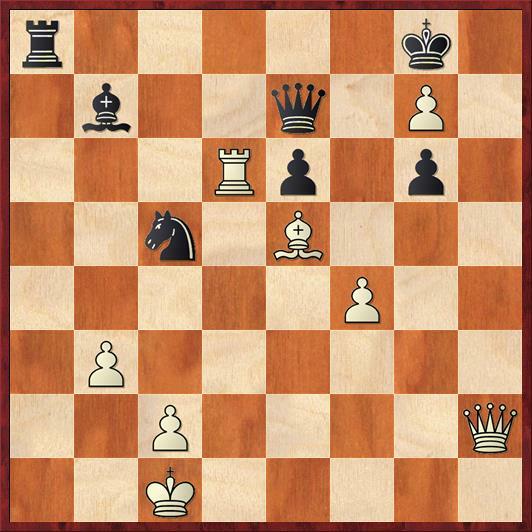 Qh5 mate is unstoppable without major loss of material. So technically, Carlsen had the right idea but played the moves in the wrong order. This is what makes action chess so fascinating. He probably had only a minute or two left here. You can see his intuition working: we want to check the king to f7, we want to play Qh7, but then he needs some kind of threat after ... Rb8. Aha! If we can play f5, then Black's whole house of cards collapses! So then, like the genius he is, he plays the crucial movefirst -- when the opponent won't understand it. But there's one thing he overlooked. If 28. ... gf 29. Qh8+ Kf7 30. Qh5+ (preventing ... Qg5+) Kg8 31. b4! is a win according to the computer. The point of this last move is to enable White's rook to get to the seventh rank, in a variation like 31. ... Ne4 32. Qh8+ Kf7 33. Qh7 Qg5+ 34. Kb2 Rg8 35. Rd7+. This is superhuman stuff -- I'm not sure if Carlsen really saw it. Black could still fight on with 29. ... Qh5. I'm sure that Carlsen saw this but thought that his position was winning after 30. Qxh5 gh 31. fe (diagram). Position after 31. fe (analysis). Black to move. Indeed, if Black plays a routine move like 31. ... Re8, then after the sick 32. e7!! White is winning. It's a classic "pair of pants" theme, where Black's king cannot control both queening squares. For example, if 32. ... Kf7 33. Rf6+! Kxe7 34. Rf8!! Bd5 (34. ... Rxf8 35. Bd6+!) 35. Bd6+! seems to do the trick. However, Black does have a cute resource of his own: 31. ... Ne4! 32. Rb6! Bd5! 33. c4! (seems to trap the bishop, but...) 33. ... Nc5! 34. cd Nd3+ 35. Kc3 Nxe5. White is better and has all the winning chances, but I don't know if you can say he is actually winning yet. This would be a terrific position for a deep analysis -- but not really germane to the subject of this post. 30. Qh8+! Kf7 31. g8Q+! Rxg8 32. 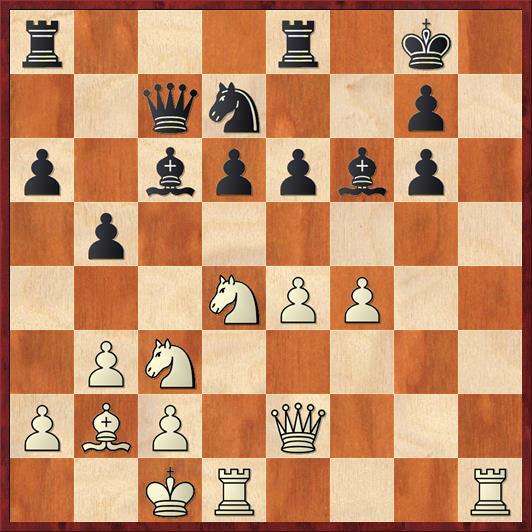 Qh7+ and Black resigned. His king gets forced away from the defense of the rook. All in all, an incredibly rich and creative game. Even Carlsen's mistakes are better than my best moves!